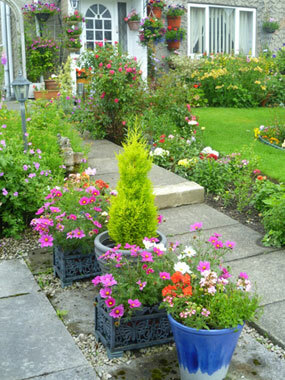 Kendal Town Council are proud to co-ordinate Kendal’s planters (using Peat Free compost) and bloom competitions. Each year the Town Council regognises the efforts of Kendal Communities via the Kendal in Bloom competition. Kendal enters the ‘Cumbria in Bloom’ competition each year and is proud to have won Silver and Silver Gilt on several occasions. All bloom achievements are only possible due to partner support and sponsorship of local businesses for the town’s planters and baskets. It is with their help that the Kendal floral displays look wonderful throughout the year and makes Kendal an even more attractive place to work, live and visit. If you or your business would like to make a donation or sponsor one of the floral display, or perhaps sponsor a category in the KiB Competition please contact us. The Kendal in Bloom Committee would be really interested to hear about any of your community initiatives or schemes that you are currently involved in. The Kendal in Blooom Committee have a small budget to help support the community intitatives that are working towards improving their local area. For more information please contact Janine Holt on allotments@kendaltowncouncil.gov.uk or telephone 01539 793495.